Treat your skin to the smoothing properties of StriVectin Advanced Retinol Intensive Night Moisturiser, an anti-ageing moisturiser that works to restore skin to a healthy state during its most receptive hours. 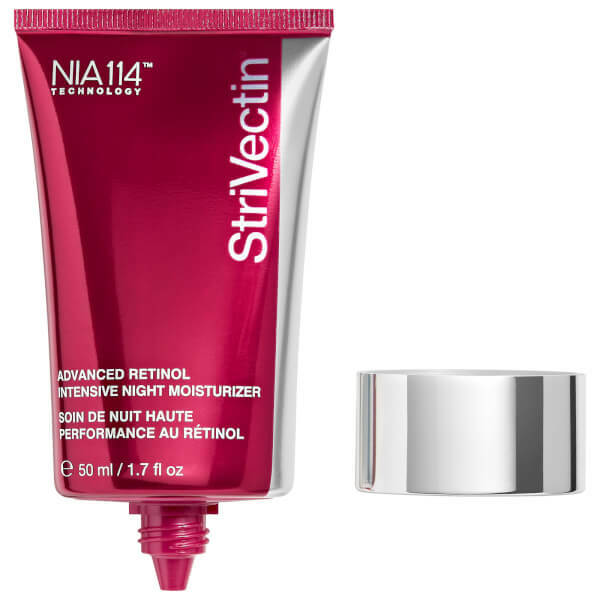 Delivering the anti-ageing benefits of Retinol without irritation, the night-time moisturiser expertly hydrates skin whilst visibly improving signs of ageing, including fine lines and wrinkles. Its dose of Retinol helps refine and restore skin for a youthful appearance, whilst Copper Tripeptides protect skin and promote rejuvenation. Expect a visibly younger-looking complexion with a more refined finish. Apply to clean face in the PM. Massage evenly and gently into skin following Advanced Retinol Concentrated Serum. Aqua (Water, Eau), Glycerin, Myristyl Nicotinate, Butyrospermum Parkii (Shea) Butter, Di-C12-15 Alkyl Fumarate, Caprylic/Capric/Myristic/Stearic Triglyceride, C12-15 Alkyl Benzoate, Glyceryl Stearate, Propanediol, Steareth-2, Myristyl Myristate, Dimethicone, Hydrogenated Ethylhexyl Olivate, Steareth-21, Caprylic/Capric Triglyceride, Pentylene Glycol, Retinol, Retinyl Palmitate, Copper Tripeptide-1, Aloe Barbadensis Leaf Juice Powder, Resveratrol, Sorbitan Oleate, Hydrogenated Olive Oil Unsaponifiables, Caesalpinia Spinosa Gum, Sodium Hyaluronate, Hexapeptide-3, Jojoba Esters, Panthenol, Tocopherol, Sodium Ascorbate, Bisabolol, Enteromorpha Compressa Extract, Salix Nigra (Willow) Bark Extract, Tocopheryl Acetate, Zingiber Officinale (Ginger) Root Extract, Caprylyl Glycol, Acrylamide/Sodium Acryloyldimethyltaurate Copolymer, Silica, Stearyl Alcohol, Lactic Acid, Isohexadecane, Xanthan Gum, Polysorbate 80, Butylene Glycol, BHT, PEG-40 Hydrogenated Castor Oil, Potassium Sorbate, Citric Acid, Parfum (Fragrance), Benzyl Alcohol, Benzoic Acid, Sorbic Acid, Disodium EDTA, Sodium Hydroxide, Phenoxyethanol, Chlorphenesin.